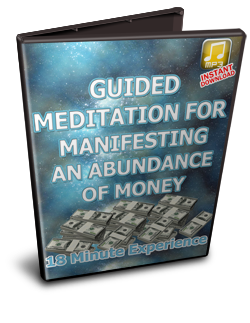 This meditation will dramatically heal and empower your relationship with money! It will take you on a journey to release any negative limiting beliefs holding you back from manifesting abundance into your life, and submerge your mind-body with a powerful NEW state of abundance consciousness! You will literally FEEL like a million dollars after you're done with this meditation! This transformational guided money meditation will dramatically shift, heal, and empower your relationship with money! It will take you on a journey to release any negative limiting beliefs holding you back from manifesting abundance into your life, and submerge your mindbody with a powerful state NEW state of abundance consciousness! You will literally FEEL like a million dollars after you're done with this meditation! How you feel on the inner world is what manifests into your outer world. When you feel like have an abundance of money throughout your day, you will manifest the situation where that level of energy is attracted to you. The Universal Law of Manifesting says that “Like attracts like”, and when you're feeling rich inside, you will attract the same richness to you on the outside! A deep cellular transformation that will shift your body’s and mind’s vibration, allowing you to effortlessly magnetize more abundance into your life. An energetic shift in your manifesting vibration and ability to attract greater financial abundance to you faster and easier! for Manifesting an Abundance of Money!